Winner of the Newbery Medal 2013. Instead, Ivan thinks about tv shows he?s seen, and his friends Stella, an elderly elephant, and Bob, a stray dog. But mostly Ivan thinks about art and how to capture the taste of a mango or the sound of leaves with color and a well-placed line. Then he meets Ruby, a baby elephant taken from her family, and she makes Ivan see their home-and his own art-through new eyes. When Ruby arrives, change comes with her, and it?s up to Ivan to make it a change for the better. Katherine Applegate blends humor and poignancy to create Ivan?s unforgettable first person narration in a story of friendship, art, and hope. Ivan, the mighty silverback gorilla, spends his days watching TV, painting and talking to his best friends Stella the elephant and Bob the dog. Not a terrible life, but their domain is a cage and they can never leave. 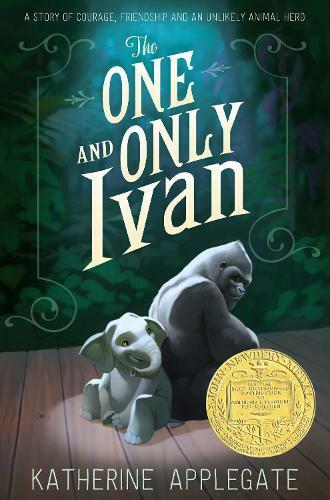 The story is beautifully told from Ivan’s perspective and at its core are the relationships he has with his friends and the young girl who visits him every day. When a baby elephant arrives, Ivan makes a promise to Stella that forces him to risk a courageous plan for a better life. Based on the true story of a great ape who spent 27 years as an attraction in an American mall, this story is heartbreaking, but ultimately inspiring, and is highly recommended for 8–12 year-old animal lovers and budding activists.